Below is the text of the speech made by the Chief Secretary to the Treasury, Danny Alexander, on 24th October 2012 in Cardiff, Wales. I’m delighted to be here today making a statement that brings more good news in the form of new commitments on the future of Welsh funding. Today the UK and Welsh Governments are announcing that we will regularly review relative levels of Welsh funding. Take from me that this is a very clear signal that the UK Government recognises that this is a major concern in Wales. I have also agreed that capital borrowing powers should be devolved in Wales, as long as there is an independent revenue stream in place to support them. In July, in a joint article, the Chancellor and I outlined the Government’s commitments to restoring competitiveness and infrastructure across the UK. We put our money where our mouth is when we announced one of the biggest overhauls of our railways since Victorian times, including the electrification of the lines from Cardiff to Swansea and the Welsh Valleys. I’d like to pay tribute to Jane Hutt. Jane it has been a pleasure to reach this agreement with you and be a part of talks that have been so genuinely collaborative. The fact that our governments can work together in this way is another shining example of the benefits of one United Kingdom. Historically, Welsh funding per person has been higher than in England but has been converging towards English levels. Our joint forecasts show that convergence is not currently occurring. In fact over the next few years Welsh funding will diverge away from England. However by planning for the long term best interests of Wales, we recognise that this is an issue of deep concern here. It is with this in mind that for the first time the UK Government will jointly assess forecasts of relative funding levels at every spending review. If convergence is forecast to resume we will look at the options to address it; and we are committed to only implementing changes that both governments can accept as being fair and affordable. Today’s agreement establishes a solid platform to consider the Silk Commission’s report, to be published this Autumn. Having seen the hard work of Calman come to fruition I am very proud to have been part of a negotiation that delivered this for Wales and I believe their recommendations could represent an historic step for Welsh devolution. Fiscal devolution is a necessary next step for the Welsh Government and opens up new opportunities to boost financial accountability and greater spending power. For the first time the UK Government agrees that the Welsh Government should be given capital borrowing powers, on the condition that this is supported by an independent revenue stream – like devolved taxes, currently under consideration by the Silk Commission. Let me be clear: if Silk recommends devolving revenue raising powers, and Wales implements them, then we put in place commensurate new borrowing powers for Wales. Devolved capital borrowing powers could be used to supplement long-term infrastructure investment, building on the measures the UK Government has already supported in Wales such as the unlocked funding to electrify the valley lines, and the funding to establish Cardiff as one of the first ten ‘Super-connected cities’ in the UK. I am delighted that the UK and Welsh Governments have worked so closely and effectively together to deliver on this outcome today. I am hopeful that we will be able to build on what we have achieved by making real progress on the Silk agenda over the next few months. We need to move quickly towards lasting reform based on consensus. This agreement opens the prospect of a new financial settlement for Wales: greater accountability, greater responsibility, more revenue raised and spent here, and more ability to shape growth, safe in knowledge that the rug will not be pulled from under their feet by some future UK Government. We have demonstrated once again that all parts of the United Kingdom benefit from working together. We are better together. Below is the text of a speech made by Danny Alexander, the Chief Secretary to the Treasury, on 10th September 2012 at The Stock Exchange Forum in London. Rarely has there been a time when the issue of growth and economic balance has been so prominent in public discussion, nor has there been a time in recent memory in which the circumstances for growth have been so challenging. So it has never been more important for Government to be focussed on meeting those challenges and delivering long term growth that is strong and sustainable, and an economy that is balanced across geographic regions and economic sectors. The role of infrastructure in delivering that goal cannot be underestimated, and so it gives me great pleasure to address you on financing and delivering through both the public and the private sector, working in partnership – to deliver on public priorities efficiently at a time when finance is in short supply. Our priority is to return the UK to sustainable prosperity and rebalance the economy. Central to achieving that is our focus on fiscal consolidation to return sustainability to the public finances and ensure the UK retains the confidence of international markets. But fiscal consolidation, though essential, is only part of the story. Delivering sustainable and balanced growth means supply side reform – to ensure that Britain is more than ever an excellent place to do business, and to raise our growth potential by creating an environment in which all sectors can thrive. There have been long standing weaknesses in the quality of our infrastructure. The quality of our roads, railways, energy and telecommunications infrastructure is an effective driver of our fiscal economic growth package, as well as a key driver of the ability to give our cities the right chance to realise their potential. This is why infrastructure is at the centre of our strategy to kick-start our economy. The Government’s National Infrastructure Plan, and the steps we are taking to implement it, are a clear recognition of the importance of infrastructure in achieving our goal. That Plan takes a comprehensive look at the UK’s infrastructure requirements across both the public and the private sector, and sets out how those requirements will be met. It outlines major spending commitments to improve our transport and broadband networks, and to attract substantial private sector investment into priority projects. It sets out concrete measures to improve the efficiency and effectiveness of infrastructure delivery – responding to and addressing concerns from businesses and investors. And it sets out the path to a stronger, more sustainable, more balanced economy. A newly established Cabinet Committee, which I chair, is ensuring that plan is delivered in full, and that all parts of Government play their part in tackling barriers to delivery and addressing commercial and public concerns. Of course, while the scale of construction and operational challenges are significant, it is the challenge of attracting the substantial necessary investment that is perhaps the most remarkable – over £200 billion of infrastructure investment over the next five years alone. Given the pressures on the public finances, and the disruption to long-term lending caused by the ongoing instability of financial markets and the Eurozone, that is no easy task, and not one that will resolve itself. Stock Exchanges like this one play a very important role providing an efficient market for that finance in such difficult circumstances, and Government has a major role to play too. I want to talk to you today about how key private sector organisations like this can work together with Government to meet the impressive challenge that we face to deliver for the UK in this challenging climate, and how we are using the best of the public sector and the private sector to promote a strong and balanced recovery. First, we are making tough choices to prioritise capital spending on infrastructure within a shrinking government budget. At the Spending Review, we took a conscious decision to protect the most productive public sector investment, and actually increased the capital spending envelope despite pressures elsewhere. In particular, we prioritised economic infrastructure that supports growth, such as investment in transport and communications – where we are investing even more tax payer’s money than at the height of the spending boom. The Spending Review supported the delivery of £18 billion of rail investment over the course of the parliament, including work that is underway on major capacity upgrades into London via Crossrail and Thameslink, a major upgrade of the Great Western Main Line, and a new electric route between Liverpool Manchester, Leeds and Newcastle, with significantly faster journey times as a result. That is alongside £4 billion to maintain and enhance the national road network, and £6 billion for major local transport projects and enhancements. At last year’s Autumn Statement, we announced a further £1billion for road schemes, and increased the £1.5 billion committed to major local transport projects at the Spending Review by a further £170 million. At Budget this year, we announced ten cities that will now enjoy ultra-fast broadband and high speed wireless connectivity as a result of Government investment, with funding set aside for a further ten. And a £150 million Mobile Infrastructure Project to deliver coverage to 60,000 rural households and at least ten key roads by 2015. In July, we announced a further £9.4 billion of infrastructure enhancement, including further targeted rail electrification, increased rail capacity on key commuter lines, and a new corridor linking the core population and economic centres in the East and West Midlands and Yorkshire with the South of England. And we plan to continue that commitment to investment beyond the current spending review period – delivering a big uplift in capacity and connectivity between our key cities through High Speed 2, and continuing a long term electrification strategy to deliver a high capacity, sustainable railway. On present plans, we will support almost £22 billion of rail investment between 2015 and 2019. Better rail and broadband infrastructure across the UK will allow businesses to flourish more easily without locating in the South East corner of the country. It will allow for a growth in rail freight and improve links between our major ports, airports and corporate centres. It will allow firms to recruit from a wider pool of workers, and workers who may otherwise be unemployed or underemployed to access a wider variety of jobs. At the same time, our investment in rail is supporting development of skills more directly – Network Rail is taking on a substantial number of apprentices and funding a programme to give placements to unemployed graduates across the industry. This is alongside our broader programme of Government funding to equip young people to deliver for the UK – funding which means that this Government will deliver at least 250,000 more apprenticeships over this Parliament then planned by the previous government. Of course, though we prioritised capital investment at the Spending Review, it is neither possible nor desirable for taxpayer money to do everything. The vast majority of the investment the UK will require will come from the Private sector. And we want to ensure that finance is as easy and cost effective to raise as possible. So second, we are doing more to help private sector investors access finance for priority projects. We are making sure that money goes further by reducing costs due to unnecessary complexity in areas like planning and regulation. And we are working with investors at home and abroad to see what we can do to help British business. While prioritising capital spending has provided the necessary public finance, our fiscal strategy also helps to improve conditions for private sector finance, against the headwinds caused by the global financial troubles. Our focus on fiscal consolidation has achieved credibility with the markets that has driven interest on government borrowing to record lows of around 1.5 per cent. That keeps interest rates low for households and businesses, as well as the taxpayer – and a 30-year yield of 3 per cent is particularly helpful for long-term investment, with benefits for infrastructure expansion and its costs to consumers. Fiscal consolidation also gives the space for the Bank of England to keep interest rates at an all time low of 0.5 per cent, and to pursue further monetary policies to support investment, such as quantitative easing and the new Funding for Lending scheme, which came into operation last month. Both policies are helping to ease credit and balance sheet conditions for financial organisations, freeing up more money to lend; and the new Funding for Lending Scheme in particular will provide strong incentives for lending, by offering more finance on more favourable terms to Banks that lend more. Our hard won fiscal credibility has also allowed us to support investment directly, for example through the ‘UK Guarantees’ scheme, also announced last month. By allowing high priority projects to benefit from the UK Government’s balance sheet credibility, we will be able to accelerate and bring forward up to £40 billion of major projects that are struggling to access private finance. Although it is still early days, interest from industry has been strong. In the six weeks since launch, Treasury has had discussions with over 30 companies and project sponsors responsible for projects worth over £5bn in priority investment areas such as energy, transport, water, waste and telecommunications. Detailed discussions are already taking place with the Mersey Bridge Gateway project, considered one of the world’s top 100 infrastructure projects, and the Green Deal project I announced a few weeks ago will also be considered to ensure it goes ahead on time. While the measures we are taking will greatly improve companies’ access to debt finance, we should recognise that the days of cheap and readily available bank originated debt finance are over. As a result, new sources of capital are increasingly important. Equity markets, for example, serve as a significant source of long term non-bank finance – during the height of the crisis, between 2008 and 2010, the amount raised in equity for publicly listed companies was similar in level to the amount pumped into the economy through Quantitative Easing. The growing retail bond market also presents potential for improving access to finance by offering issuers the opportunity to reach out directly to retail investors. National Grid raised a record £260 million through this medium in October last year. Following Tim Breedon’s report, that we commissioned to examine the structural and behavioural barriers to alternative debt markets in the UK, we are committed to ensuring a proportionate regulatory regime to support these important lending channels. More broadly, we are working with private sector investors to understand what more we can do to ensure that the deepest possible sources of capital are available to the widest possible range of projects, and to promote inward investment from abroad. For example, the new Pension Infrastructure Platform, which we have committed to establish with the National Association of Pension Funds and the Pension Protection Fund, will allow UK pension Funds to invest directly in UK infrastructure assets and projects in a new and more efficient way. We have now obtained written confirmation from seven UK pension schemes to fund start up costs, and soft commitments for initial capital allocations. We expect the Platform to raise its target £2 billion by January to start investing in key projects. Another productive area of collaboration has been the Insurers Infrastructure Investment Forum we set up with the Association of British Insurers. Through this, we have looked at how projects can be better structured to meet the investment propositions of annuity funds and liability-driven investments, and found ways to maximise opportunities for insurance fund managers to invest in infrastructure debt instruments – engaging with credit rating agencies, improving performance data reporting to creditors, and developing a private market for unrated or lower rated debt. Meanwhile, UKTI continue to do excellent work promoting UK infrastructure for inward investment from sovereign wealth funds and other institutional investors overseas. And we have seen a number of high profile successes this year, including from China, Japan, Qatar and Kuwait. While we have achieved much both through targeted government spending and through freeing up private finance, there is still scope to improve how the private sector and public sector can work together in more innovative and productive ways. While past PPP arrangements have on occasions been less than perfect, I firmly believe that with the right approach and focus, the right partnerships can use the skills and innovation of the private sector to deliver on public and social priorities more effectively than ever before. So to finish off, I want to talk about what we are doing to improve our work with the private sector to deliver real value for money for taxpayers. The UK Guarantees Scheme, which I mentioned earlier, could also allow up to £6 billion pounds of public-private partnership projects to proceed without delay. And we are looking at how more innovative modes of working with the private sector can allow us to meet the UK’s infrastructure demands. At Budget, we announced options to improve A14 capacity that could be part financed through tolling, and more broadly, we are looking at ways to increase the role of private investment in the strategic road network. For example, looking at how a Regulatory Asset Base could be used to expand private investment in roads infrastructure, while improving efficiency. We will be announcing the results of that study later this year. With sovereign bonds and other long term assets either seen as riskier, or with yields at all time lows, investors are queuing up for utility assets to invest in with guaranteed returns over long periods, and we hope to be able to unlock some of that investment to good effect. That rise in investment could bring England’s roads up to the best in Europe – reducing congestion and travel time on key routes through expanding hard shoulder running schemes, dualing existing A roads, and adding lanes to existing motorways. In the longer term it could be used for new routes. Another area where private money can help to deliver our public goals is in Energy. By 2020 we plan to generate 15 per cent of our energy from renewable sources, and Ofgem estimates that £200 billion in energy investment will be required between now and then. That is a challenge that cannot be met with the often haphazard and wasteful approach to Government subsidy taken in the past. The private sector will need to take the lead, supported by a Government committed to removing the barriers and uncertainty that have for too long prevented the necessary investment. At the end of July we launched the Banding Review for the Renewables Obligation. We also recently published our draft legislation on Electricity Market Reform, which will reform the Energy Sector to ensure that it can access the finance required to meet our Carbon reduction and energy security needs. transitional arrangement to ensure that the existing Renewables Obligation can operate stably once it is closed to new generation in 2017. In addition, we have granted development consent to 24 energy generation projects all over the country since 2011, supporting over 4000 construction jobs and producing enough electricity to power over eight million homes. Finally, we are reforming PFI to ensure that it secures long-term value for money for the taxpayer, while also making sure we retain the benefits that successful PFI can deliver – getting projects built to time and to budget, and creating the correct disciplines and incentives to manage risk effectively. We’ve seen high levels of engagement, with over 150 written responses to our call for evidence, and around 100 stakeholder discussions to support this process. We are now considering the wide spectrum of views expressed on how best to achieve more effective use of private sector innovation, skills and investment, to reduce costs, improve flexibility and increase transparency, and we will be setting out our conclusions this Autumn. By being proactive and innovative about helping the private sector deliver for the UK, we can promote a recovery that will allow Britain to rise from the economic turbulence as a stronger and more balanced economy. We are already starting to see returns to our approach – 840,000 private sector jobs created since early 2010, and the UK rising to 8 in the World Economic Forum Global Competitiveness Rankings this year – up from 10th last year, and ranked 6th in the world for infrastructure. Of course, there is still much to do, and I hope I have shown you today that we are getting the most out of Government’s strong fiscal position and the private sector’s creativity and expertise. We will continue to look at what more we can do to make it easier for investors and firms to help us deliver on the UK’s priorities, and I look forward to hearing from you today about the challenges faced and how we can continue to help to address them. Below is the text of the speech made by the Chief Secretary to the Treasury, Danny Alexander, at the Centre Forum in Guildhall on 10th May 2011. Today, what I want to focus on is the role the financial sector has to play in our economy. Now, as a topic, this is not something new. Much of the economic and political debate of recent years has revolved around this issue. But instead of discussing the importance of tighter regulation or banking reform, what I want to concentrate on is the industry’s role in restoring trust in the financial system and how your actions can help with the rebalancing of our economy, and its success in the future. And there are a number of reasons to look to the future with confidence. Of course the recovery is, and will be, choppy. But, the manufacturing sector has experienced incredibly strong growth in the last year. Our exports are gathering pace. But the fact that we can now look ahead with some confidence is only because of difficult decisions we’ve already had to take. Decisions that have brought about economic stability. Secured our international credit rating. And set in place a credible plan to deal with our record borrowing… a plan that has seen us avoid the sovereign debt issues that have engulfed other countries. These are tough decisions. It was the need to deliver these decisions that brought the Coalition together. Our commitment to that shared plan is totally unwavering. It is our core task – and we will see it through. – create a more educated workforce that is the most flexible in Europe. We also took the first steps towards making these ambitions a reality. With cuts to corporation tax – to encourage greater enterprise. Support for SME finance – to increase business investment. Steps to ease burdens on business to create additional jobs. And measures to rebalance our economy – and drive higher exports. But as a Government, we can only do so much. It’s the private sector who will inevitably lead the recovery. And having a strong and stable financial sector is an important part of this story. We need a financial sector that supports consumers and businesses up and down the country. And is a source of wealth and prosperity in its own right – not just in the Square Mile, or in Canary Wharf, but in every town and city in the country. And I feel there are three things that we have to consider if we’re to realise this ambition. The first of these is about reconnecting the financial sector with the rest of the economy. To strengthen the ties that exist between financial institutions, investors, and their customers. – the capital that will help stimulate enterprise across the UK. Because if our financial sector doesn’t meet these tests, then we’ll have an economy that struggles to respond to today’s challenges; a country that doesn’t fulfil its potential; and a recovery that fails to gather momentum. If we take access to finance, for instance. This remains a key concern for many businesses in the UK. Yet I also know that the problem isn’t quite as straightforward as some commentators like to think. But we also have to look at the reality of the situation, and why lending conditions have deteriorated since the crisis. That the past few years have certainly thrown up some particularly large challenges for the finance industry. Institutions up and down the country have, quite understandably, had to retrench; weather the financial storm; and look to rebuild their balance sheets. And this has not been a pain free process. On the one hand, you’ve had people saying that we should never return to the days when cheap credit was freely available… and irresponsible lending conditions undermined overall economic stability – this is absolutely right. But on the other, businesses need affordable credit to help support growth, employment, and additional investment. So there’s a very difficult balance to strike. As a Government, we’ve been working with the financial sector to get credit flowing again. The Merlin Agreement being the most obvious example. Among other things, this agreement reached with the UK’s largest banks should see lending of £190 billion to creditworthy businesses for this year… of which £76 billion has been earmarked specifically for small businesses. This would mean an overall increase of almost 15 per cent on last year’s lending figures to SMEs. But having made this commitment, it’s vital that they see it through. This month we will get the first update on progress in meeting this target. My message to the banks is simple – this money needs to reach good businesses, no ifs, no buts, no excuses. As the Chancellor said in February, if it doesn’t, we reserve the right to take further action. Not just for the sake of the wider economy, but also for the banking sector itself. People want to see progress. To demonstrate the value that financial services have to add. To show everyone that the sector takes its responsibilities seriously. Which brings me to my second point for this morning – the need for the financial sector to improve the relationships it has with its customers. Because if we’re to improve sustainability and resilience across the economy, we need to safeguard the interests of savers and borrowers and taxpayers. Now despite the work of the FSA, I don’t believe that customers always get a fair deal from financial services. Personal banking in many ways has become, well, less personal. We’re committed to changing this. That’s why we’re setting up the new Financial Conduct Authority – or FCA for short. The FCA will look at the conduct of all authorised firms – whether they’re prudentially regulated or not. It will be, in effect, a champion for the consumer, with the the primary objective of “ensuring confidence in financial services”. And this will be to the benefit of everyone. Consumers will obviously benefit from the added protection that this will bring. But also financial institutions themselves will reap the rewards. Because if customers have effective and appropriate protection, they’ll also have more trust in the financial sector as a whole – and take advantage of more of the services you provide. But the FCA alone is not enough. With the industry’s support we’re also increasing consumer confidence by making financial markets more transparent. So that people can shop around for better rates on their ISAs and have access to financial advice through the Annual Financial Health-Check. This will give your customers the confidence to invest in a wider range of products, and this will feed through to the rest of the economy. Because a customer who buys a corporate bond is also providing the finance needed to support innovation. Money in a cash ISA supports lending to businesses and families. While money in an equity ISA or pension can help support private investment. Working in the interests of customers is working in the interests of the wider economy. The two are mutually reinforcing. And we are making other regulatory changes too, to learn the lessons of the financial crisis. The Independent Commission on Banking’s work is crucial to protecting taxpayers. Its interim report set the right direction: we look forward to the final report and to action on it. Which brings me to the final point of today – how the financial sector can help support the much needed rebalancing of our economy. As a Government, we want to see growth and prosperity spread across all regions of the UK. We want to help the economy develop new areas of expertise. But we also need to preserve our existing strengths – including in financial services. Rebalancing is not about trading the success of one sector for another. It is about extending our country’s portfolio. Spreading our success more evenly. And supporting the world class industries we already have, as well as the new ones that we’re developing. If we go back to the roots of the City, for example, it flourished because it supported commerce through insurance and trade finance… it found capital to invest in new enterprise and it developed new and innovative ideas that provided security and certainty for businesses. It was this that proved the foundation of your success. And it is through insurance, investment and lending that you’ll help support our transition to a more diverse economy. One that’s built on growing businesses, not growing deficits. Increased exports, not increased debts. And green energy, green infrastructure and green technologies. This is a huge opportunity for the financial sector. To help support our move towards a better balanced economy. Where growth is more sustainable. And more evenly spread across the many places of the UK. As a Government, we’ve provided the security and stability that the private sector so badly needed. With a credible plan to deal with our country’s debts. And an ambitious plan for growth. But as a Government, we can’t do this alone. We need a strong and stable financial sector to support the recovery. One that provides the lending essential for investment. Restores trust and confidence in British business. And helps rebalance our economy in favour more industries, more exports, and more evenly distributed success. And we will work with you to make it a reality. Below is the text of the speech made by the Chief Secretary to the Treasury, Danny Alexander, at the 2011 Liberal Democrat Party conference. I’d like to tell you about a man who’s been a great source of inspiration and guidance to me behind the scenes over the last year. Although outwardly dour, his finely tuned political antennae and no nonsense style make him the perfect sounding board. He’s not flash – he’s just Gordon. Gordon Birtwistle, the Liberal Democrat MP for Burnley. One of the most talented and tenacious of our 2010 intake. I’m privileged he agreed to be my PPS. Alistair Darling wasn’t quite so keen on his Gordon. His Gordon racked up a record deficit fuelled by irresponsible and unsustainable spending. His Gordon denied any responsibility for the economic woes caused by his own policies. His Gordon “unleashed the forces of hell” simply for sharing his views on the severity of the economic crisis. Who was feeding Gordon Brown such advice? Was it Mandy? Or McBride? I think it’s pretty obvious – it was all Balls. Vince Cable led the way in warning of the dangers that were building. And we made a historic decision last Spring. When we signed up to coalition government, we knew our country’s economic stability depended on it. Returning our country to lasting prosperity is the founding purpose of this Government – the overwhelming national interest that motivated two very different political parties to take responsibility together for a full 5 years. We resolved to act in the national interest and put our country first. That is what we’re doing. “In government, on your side” doesn’t mean telling people there’s an easy answer to the horrendous problems Labour left. It means telling it straight. To get things right for the long term, we must stick to our guns now. And we shouldn’t forget the impact of our unity and our resolve. Concern about both sovereign debt and economic growth is at the heart of the current market turbulence. Turbulence fuelled by uncertainty about the ability of political leaders across the globe to take the decisive action their countries need. Since we came into office, our coalition Government has taken the difficult, and sometimes unpopular decisions necessary to fix our economy. This decisive action has made an immediate impact. Interest rates have stayed low, keeping workers in their jobs and families in their homes. Fellow Liberal Democrats, we played a decisive role in securing our country’s financial credibility. This should make us proud. We have built a strong shelter, but the storm is still raging. Elsewhere in Europe, the struggle to establish credible deficit reduction plans goes on. In the US, political deadlock brought a historic downgrade of the country’s credit rating. Yet despite all the evidence, the party that put us in this hole just want to keep digging. Labour say our motivation is dogmatic. They’re wrong. It’s practical. Financial discipline is necessary for effective government. It would be completely wrong to leave the bills for past mistakes to be paid for by our children. The economic case is indisputable – that’s what so many of you have done in local government, and that’s what we must continue to do in central government. We must stick to our plans and we will. We’ll be straight with people: about how long this will take; how hard it will be, and what we will do to get it right. A huge deficit, an unbalanced economy, our trading partners in real difficultly. These are very big problems. Solving them will take years, and every one of us has a role to play. To support growth, to help families under pressure. As Liberal Democrats, our judgements about what needs to be done should be driven by the liberal economy we want to build. A liberal economy built on long-term investment, not debt and waste. A liberal economy where taxation delivers fairness. Sustainable, balanced, competitive, fair. To get the kind of growth we want, we must break down the vested interests – the enemies of growth that stand in the way of future prosperity. We are prepared to take them on. We will name and shame those standing in the way of that central national purpose. Free trade has been a liberal rallying call for centuries. Offering gains to countries around the world and especially for Britain, with our quality exports and trading history. Today our trade policy is being brilliantly led by Ed Davey. The inception of the European single market a quarter of a century ago helped create hundreds of thousands of new jobs. Completing this work will support growth, jobs and competitiveness not just in Britain but across the whole of Europe. There’s an opportunity for Britain to lead this agenda right now – as we did so successfully in the 1980s. As the Eurozone seeks to deepen its integration – and we need it to do so more quickly – they will need our support. And they will get it. Sadly, eurosceptics on left and right still fail to understand Winston Churchill’s insight that sharing sovereignty strengthens our influence and isolation weakens us. Scottish Nationalists make the same mistake. We’ll never let the anti-European isolationists or nationalists frustrate our national interest. They are enemies of growth. Fortunately, coalition ministers are united in pursuing a policy of practical, pragmatic engagement in the EU. Nick Clegg and I are working with David Cameron and George Osborne to make deepening, strengthening, and deregulating the single market a central aim of Britain’s European policy – because it will bring jobs and growth. Too many businesses are being held back by congested roads, slow railways, inadequate broadband. At the spending review last year, we looked at infrastructure spending in the round, picking only the most economically valuable projects from across government for funding. And as a result, we’re investing more in the transport network over these 4 years than Labour managed in the last 4. The redevelopment of New Street Station here in Birmingham, the Mersey gateway bridge, Crossrail in London, and a national high speed rail network. And we have prioritised the money to invest to make sure that high speed broadband gets to every part of the country. Now more than ever, we need to get on with this work. But there’s a major vested interest in the way. Bureaucracy, rules and red tape that mean it takes years to get things done. A planning system that can take more than a decade to allow even modest developments to go forward. It has to change. And under the coalition it will. I know there are concerns about our planning reforms. So it’s important to understand what we’re really doing. The presumption of sustainable development is right because it establishes the right balance. Local communities in the driving seat, local protections in place and yes more local homes and local jobs. So while it is politically contentious – we will reform planning. As Chief Secretary, I set the rules that control public spending. Mostly, that’s about making sure we stick within our budget, which I’m sure you can imagine doesn’t always make me very popular. On infrastructure, I’m pressing departments to make sure they deliver their plans on schedule. And we need to do more. More to help support jobs and growth in our communities. Because growth can’t be imposed from the centre – it must be driven by businesses, communities and local authorities. They are critical to delivering the jobs and homes that our communities need. So I’d like to tell you about the next steps in our Plan for Growth. To support local growth, I can today announce my decision to reduce the interest rate offered to local authorities by the Public Works Loan Board to finance the £13bn of debt needed to leave the Housing Revenue Account subsidy system. I’ve listened to local authority concerns that this is a one-off transaction within the public sector and should be financed as such. Let me put it simply – an extra £100m every year that councils can then reinvest in housing. And I want to take a further step to support local growth. Across the country, projects are being held back by tough market conditions, difficult cash flow and a lack of confidence. Projects where people could be working but aren’t. That is why I’m announcing today the creation of a new Growing Places Fund. Half a billion pounds that will kick start developments that are currently stalled. Half a billion pounds that will deliver key infrastructure and create jobs. Putting local areas in the driving seat, to boost the local economy and get people into work. Providing flexibility to local areas to recycle funding for other projects once development is completed. In South Gloucestershire, £300 million of private investment, 3,000 jobs and 2,200 homes is being unlocked with £6 million of public money to build a link road. Just think what we will be able to do with £500 million. Unlocking local growth by freeing businesses to grow, creating jobs, and freeing councils to build housing. Liberal Democrats in government, on your side. We’re on your side when it comes to the banks too. Delivering on our promise to protect the taxpayer from the cost of future bailouts. Never again should bankers go to the casino with their stakes guaranteed by the rest of us. It’s why we welcomed his recommendations on ring-fencing. It’s why we welcomed his call to extend competition in the banking sector. And it’s why we will legislate to protect future taxpayers in this Parliament. Of course, our main tool to help low and middle income families with the pressures they are facing is the tax system. Thanks to Liberal Democrats there is genuine progress. And I’m not just talking about fuel duty cuts for our remotest communities, though I expect we will have that in place next year. This year, the average worker is paying £200 less income tax than last year. Next year, the bill will come down by another £120. By the end of this Parliament, most working people will be paying £700 less income tax a year. Conference, an income tax threshold of £10,000 was the first priority in our manifesto. Now it’s the first tax priority of the government. We should be proud that in government our ideas are making a real difference to every working family in Britain. But we shouldn’t rest on our laurels. In the next Parliament, I want us to go further; our aspiration should be that someone working full time on the minimum wage should pay no income tax at all. An income tax threshold of £12,500 – think what that would do to work incentives, think what it would mean for basic fairness. Let’s put that on the front page of our next manifesto. Some people have argued that we should change our tax priorities and focus our limited resources on cutting taxes for the wealthiest instead. At a time of austerity, this argument simply beggars belief. If we are all in this together, those with the broadest shoulders must bear the greatest burden. Fair taxation of the wealthiest is key to our deficit reduction plan. Of course, if a better way can be found to raise the money from this group, I will be willing to consider it. But right now we must focus relentlessly on those who are struggling. And we need to make sure tax owed is tax paid. Last year, I announced a package of investment to strengthen our fight against tax evasion, as well as tax avoidance. Let me tell you how we’re getting on. This year, an additional 2,250 HMRC staff will move into new anti-evasion and avoidance jobs. This month, over 1,000 of these jobs are being advertised. And already this package is bearing fruit. And I can tell you we’re already on track to raise £2bn this year. It took 12 years for the previous Government to take action against the wealthiest 5,000 people some of who weren’t paying their fair share of tax. In less than a month’s time, a new ‘affluent team’ will be place. This team will look specifically at the next 350,000 wealthiest taxpayers. These are the people who pay or should pay the 50p rate of tax. And my message to the small minority who don’t pay what they owe is simple, I agree with the Chancellor. “We will find you and your money” and you will pay your fair share. Economic credibility comes from doing the right thing – that’s why Labour lost it. At the next election, we can make sure there will be only one party that people trust to both handle the economy and deliver fairness – the Liberal Democrats. We’ll win that trust by sticking to our guns, especially when times are tough. We’ll do that by levelling with people about the scale of the challenge we face, not offering false promises as Labour did. By delivering our aspiration to rebuild a more sustainable and balanced economy. By showing that we understand the fears and the pressures on the people of this country, and share their ambition for a better Britain. Most of all, we will do that by building a shared sense of national economic purpose so that we are working alongside every person in this country to restore our prosperity. Do you remember how Gordon Brown liked to conclude his speeches? Long lists – did you find them annoying? I know I used to. tackling tax avoidance, and cutting taxes for those who need it most. That is the economic policy of the Liberal Democrats in government and it is a record to be proud of. Below is the text of the maiden speech made by Danny Alexander in the House of Commons on 19th May 2005. Thank you, Mr. Deputy Speaker, for the opportunity to make my maiden speech in this House today. I start by congratulating my right hon. Friend—sorry, my hon. Friend the Member for Falmouth and Camborne (Julia Goldsworthy). I was going to say that Cornwall had maybe discovered another star of the future, but perhaps I have promoted her somewhat too quickly. I congratulate her on her maiden speech and I congratulate other hon. Members who have made their maiden speeches today. I am personally grateful to hon. Members from all parties, but especially to Liberal Democrat Members and to the staff of the House, whose advice and kindness have helped me and other new Members to find our feet. I am proud to say that I am the first Member of Parliament to represent Inverness, Nairn, Badenoch and Strathspey. This is a new constituency, and there are many in Scotland. Three quarters of the constituency was previously within the Inverness East, Nairn and Lochaber constituency. I pay tribute to David Stewart, who was the Member of Parliament for that constituency from 1997 and the Labour party candidate at the election. A quarter of my constituency was previously represented by my right hon. Friend the Member for Ross, Skye and Lochaber (Mr. Kennedy). Indeed, that is not the only thing that we have in common, for we are both former pupils of Lochaber high school and, as has been remarked upon in the press, share a hair colour that is perhaps more prevalent in the far north of Scotland than anywhere else. I have been very grateful for his help and support locally over the past year as a candidate, as well as for his outstanding leadership of the Liberal Democrat party, which has seen us to our best performance in a general election since the 1920s. Both my right hon. Friend and Lord Russell-Johnston have spoken up loudly for the highlands and for their principles, and if I can live up to their standards in the years to come, I shall be serving my constituents well. Like them, I shall work hard for everybody in my constituency, irrespective of their party preference. Inverness, Nairn, Badenoch and Strathspey is the longest name of any constituency in the country—indeed, to some it may prove to be something of a tongue-twister. While many Members can speak of the visual attractions of their constituencies, I believe that Inverness, Nairn, Badenoch and Strathspey can rightly be described as one of the most beautiful of all. It is also one of the most diverse, encompassing the fast-growing city of Inverness, the remote splendour of the Cairngorm mountains, the mysteries of Loch Ness and the popular seaside town of Nairn. I have not yet had the pleasure of canvassing the most famous resident of Loch Ness, but I am reliably informed that she is not a Labour supporter. Like the Prime Minister, Nessie was not seen in my constituency during the election campaign, but unlike the Prime Minister, her reputation has grown as a result. Tourism is one of the most important industries in the area and hon. Members on both sides of the House can be assured of a warm highland welcome as and when they choose to visit. Indeed, I hope that the Prime Minister will now take the opportunity to do so. One of the most important recent developments in Badenoch and Strathspey has been the creation of the Cairngorms national park, and I previously worked for the park authority. Readers of the National Geographic Magazine recently voted the highlands one of the top 10 sustainable tourism destinations in the world. Clearly, the need to develop the tourist industry further must be accommodated in such a way that it does not at the same time undermine the natural features that attract the visitors in the first place. We must not kill the goose that lays the golden egg. As Members on both sides of the House are all too aware—the right hon. Member for Fylde (Michael Jack) eloquently made the point in his speech earlier—threats to our environment are more often international than local. The threat and indeed the current reality of climate change are all too apparent to my constituents, not least because they are highly visible through the fortunes of the Scottish ski industry. The Cairngorm mountain ski area has successfully diversified into a very popular summer attraction, as the amount of time and the snow available for winter sports have fallen as a consequence of global warming. I hope that we might finally see some genuine progress made on that most pressing question when the G8 comes to Scotland in the summer. I am proud to represent the whole of the city of Inverness, capital of the highlands. Britain’s most northerly city is also one of the country’s fastest growing. The quality of life, as well as the quality of employment, have caused the population to rise, especially in the Inverness and Nairn areas. As well as being a service centre for the highlands, with much income from traditional areas such as tourism, Inverness is home to an increasing number of innovative modern industries, particularly in the medical field. The success of LifeScan Scotland, formerly Inverness Medical, which now employs more than 1,200 people, is helping to attract many new businesses to the area. Inverness’s growth and success present challenges, not least the fact that, despite recent progress, with wages at 80 per cent. of the UK average, the highlands and islands is still one of the poorer areas in the United Kingdom. Problems caused by remoteness are as pressing as they were when Russell Johnston raised them in his maiden speech in 1964. Of course, there has been progress, and I pay tribute to the work of many public agencies in the highlands. The fact remains that there is considerable room for improvement in all aspects of the transport network—bus, train, road, and air—in my constituency, despite the substantial progress made under Nicol Stephen, our Liberal Democrat Scottish Executive Minister for Transport. Effective transport links between the highlands and London are vital for the region’s continued growth, so it is a matter of regret that the Government have so far not seen fit to protect vital air routes between Inverness and London with a public service obligation. Considerable further investment is also needed to improve road and rail infrastructure around Inverness and between Inverness and Nairn, particularly by upgrading the A96 and completing the Inverness southern link road. Perhaps the most pressing problem across the highlands—and, as we have heard in other speeches today, in many areas across the country—is the shortage of affordable housing. The rapid rise in house prices has pushed owning a home beyond the means of many local people. One Conservative Member has already confessed to me that he owns a second home in my constituency. I look forward to meeting him there, but I have to say that demand for second homes has enormously exacerbated the problem of the shortage of affordable housing. We need radical solutions, which will be one of my priorities during this Parliament. Although housing policy in Scotland is a matter for the Scottish Parliament, decisions made here can have a significant impact on the problem. Our rural areas are home to many thousands of people, so services in small communities such as those that I represent must be preserved and enhanced, not undermined or removed, as has been the fate, for example, of too many post offices in recent years. I look forward to the next stage of that adventure and I thank hon. Members for their forbearance of my opening foray today. Below is the text of the maiden speech made by Peter Aldous in the House of Commons on 27th May 2010. Thank you, Mr Deputy Speaker, for giving me this opportunity to make my maiden speech. I will start by paying tribute to the hon. Member for Swansea West (Geraint Davies) for his passionate, detailed and knowledgeable speech on climate change. Indeed, it has been marvellous to listen today to some great speeches. We heard the speech of the new hon. Member for North Antrim (Ian Paisley), whose brother is a minister in my constituency, Waveney in Suffolk. We then heard the speech of the new hon. Member for Ealing Central and Acton (Angie Bray), who listed some films that had been made in the famous Ealing Studios. She actually missed out the most famous, “Kind Hearts and Coronets”, where the star had a particular way of getting into the other place. I think that constitutional reform will put an end to that. I chose this debate to make my maiden speech because energy and offshore renewable energy is vital to the future of my constituency-Lowestoft and the surrounding area, which have suffered from industrial decline for the best part of 30 years. I pay tribute to my predecessor, Mr Bob Blizzard, for the work that he has done over the past 13 years. He has been a passionate advocate for Waveney and a hard-working and diligent MP. I thank him for all the work that he has done. Waveney is the most easterly constituency in the country. Perhaps at times, we Suffolk people hide our light under a bushel and do not make the most of the virtues that we have. The constituency’s make-up is diverse. We have the coastal town of Lowestoft, famous for its fish, its maritime history, its decent, honourable people and its clean beaches. There is the fishing village of Kessingland, and the market towns of Bungay and Beccles, and wide open rural expanses in between. The people up there do at times feel that they have been forgotten down here. It is as if we were at the end of a line. We have been crying out for better roads and railways for what seems like many, many years. I will continue to make that cry, as other Waveney politicians have done. In November 1959, Jim Prior, now in another place, described the road and communications system in East Anglia as the Cinderella of the country. It seems as if we have not got very much further in the past 50-odd years. We have industries that have declined. The fishing industry is no longer what it was; shipbuilding has gone; and the canning factory has gone. That is what we need to address. I am not going to moan; offshore renewables present us with a great opportunity to bring Waveney into the 21st century. It was an opportunity that Bob Blizzard recognised, and I will be taking the baton from him to make sure that we deliver on that goal. We need a new and radical energy policy. If we do not have it, the lights will go out. We need to be in control of our own destiny. We need energy security. We owe it to future generations to take a major step towards a low-carbon economy. We need a mixture of energy sources-green energy sources. To me, nuclear has a vital role to play; so, too, does clean coal, and micro-energy is also of great importance, but it is offshore renewables on which I want to focus. We have to get 15% of our energy supply from renewables by 2020. We have a lot of work to do, being at just over 5% now. There are great opportunities for green jobs; I see that it is estimated that there will be 1.2 million by 2015. If we do not do the work, we will fall a long way short. Lowestoft has a great opportunity, and great advantages in setting about giving us those green jobs and taking us forward. It has a great location, close to where the offshore turbines will be-the East Anglia Array and the Greater Gabbard. We have a skills base, built up over many years, in fishing, in shipbuilding, and in the North sea oil and gas industry. Those skills are transferrable, and we can make best use of them in the renewables sector. We have to improve our training and education. We have a further education college that is delivering skills, and there is the opportunity for University Campus Suffolk to provide higher education with regard to those skills. We also need to reinvigorate the apprenticeship system, which, in Waveney and Lowestoft, has been so important in our past. There are measures in the Queen’s Speech that will help to deliver that. I am here to represent Waveney, but I must not be parochial. To deliver green energy, and get the renewables that we need, I have to think outside my constituency, and think about the surrounding constituencies. In East Anglia, we have great opportunities. There is a deep-sea port in Yarmouth; that will help us to bring opportunities there. There is land elsewhere in other constituencies, too. I see that my hon. Friend the Member for Great Yarmouth (Brandon Lewis) is not here at the moment; in the past, Lowestoft and Yarmouth have spent a lot of time fighting each other. We fought on opposite sides in the civil war, and we had the herring wars, but we are united now in seeking to deliver the renewable energy opportunities. The energy Bill will be a foundation stone; we have to build on that for the benefit of Britain, East Anglia and-to go back to being parochial for a minute-Waveney. Looking at it from Britain’s point of view, we have the opportunity to lead the world in a transition to a low-carbon economy. We owe it to future generations to grasp that opportunity. Below is the text of a speech made by Jonathan Aitken on 26th May 2009. As some of you know I have the unhappy distinction of being the only British cabinet minister ever to have been sent to prison. These days, quite a few people seem to be surprised that I am the only one. But despite the obvious ironies of being invited to open our discussion today, perhaps I can bring to it both a worm’s eye view and a bird’s eye view of the subject. The worm’s eye view, which I acquired involuntarily by spending 7 months in Her Majesty’s prisons for perjury, does concentrate the mind wonderfully on why some politicians fail tests of character to do with the truth. In my own case it was largely to do with pride, a theme which may recur in other cases. But on the principle that poachers sometimes make good gamekeepers I also want to offer you a bird’s eye view of why our present Parliamentary system has been failing. Coupled with some concluding thoughts about how the best practices and highest ideals of Parliamentary democracy could be made to work far better than they are working today. In short, using the title of Peter Hitchens stimulating book The Broken Compass, I want to ask 2 questions in the spirit of seeking after truth. 1. Why is our national political compass broken? 2. How could we fix it? In the present mood of public anger about Parliamentary expenses there may be some confusion as to whether we are talking about individual, institutional or constitutional failures. Individual failures of character in politics are not new. Jack Profumo was a close friend and Parliamentary colleague of my father’s. I vividly remember as a teenager in the summer of 1962 when the utterly broken Jack Profumo secretly came to stay with us in our home in Suffolk to escape from media hounding. Yet for all the lampooning by Time, the fact of the matter was that the institutional standards of Parliament in regards to truth were not in any danger of failing in 1962. For an MP to lie in a personal statement to the House – traditionally heard in silence and without questioning – was regarded to be as massively serious a breach of Parliamentary rules as to lie on oath in a court room is regarded as a breach of the law. So both Profumo and I were rightly punished – although for individual rather than institutional failings. Today’s broken compass is different because its exposed failings suggest that an entire political class has lost its bearings. Of course we all know that on the expenses scandal large numbers of decent MPs have not, to paraphrase the words of the Anglican general confession, “followed too much the devices and desires of their own hearts” – or pockets. There are still plenty of good and honourable members. Yet the Parliamentary compass is evidently broken and I think that is so for far deeper reasons than claims for flipped mortgages, moats, beams, bathplugs and duckhouses. 1. The failure to scrutinise huge swathes of legislation with anything like the same level of debating time and due diligence that almost all Parliaments in the first nine decades of the 20th century applied as a fundamental duty of MPs. 2. The handing over of Parliamentary authority to an ever increasing number of unelected bodies ranging from politically correct quangos to the EU commission. Power has drained away from Parliament as a result and marginalising MPs. 3. The increase and almost automatic use of the Parliamentary guillotine to cut off debates on Bills. The first Blair government even invented a corrupt device by which parts of Bills are “deemed” to have been debated by Parliamentary committees when they have not actually been debated. So much for truth in politics there! 4. The failure of Parliament to protect the erosion of traditional British liberties in the cause, occasionally justified but too often unjustified, of strengthening the criminal justice system, particularly in regard to terrorism. 5. The rise in power of the party whips’ offices and their centralised control over independent minded back benchers – who have become an almost extinct species as a result. The whips now suppress dissent and control all committee chairmanships and memberships – which is wrong. 6. The undermining not only of Parliamentary independence but also Civil Service independence. This has been achieved by the appointment of large numbers of “special advisors” on the government’s payroll who act as Prime Ministerial spin doctors and acolytes, again marginalising MPs in the process. 7. The undermining of what used to be called the adversarial system of long and sometimes fierce Parliamentary debates over all important legislative proposals. Peter Hitchens writes powerfully about this in the final chapter of his book. He argues, and I agree with him, that the historic traditions of adversarial argument in Parliament have almost completely ceased. Instead we have the creation of a cosy Parliamentary consensus in which too many important issues get short changed or even ignored by the political class. As Peter Hitchens puts it: “Political parties have become devices for representing the views of the establishment to the people rather than the other way round”. 8. The cumulative effect of these changes has been to turn the peoples Parliament into a politicians Parliament. This introverted approach has increased the power of government and outside bodies at Westminster’s expense. Toomnay MPs have been reduced to impotent time-servers. They have long forgotten the wise dictum of Mr Gladstone: “Parliament is not the government. It is the check upon the government”. 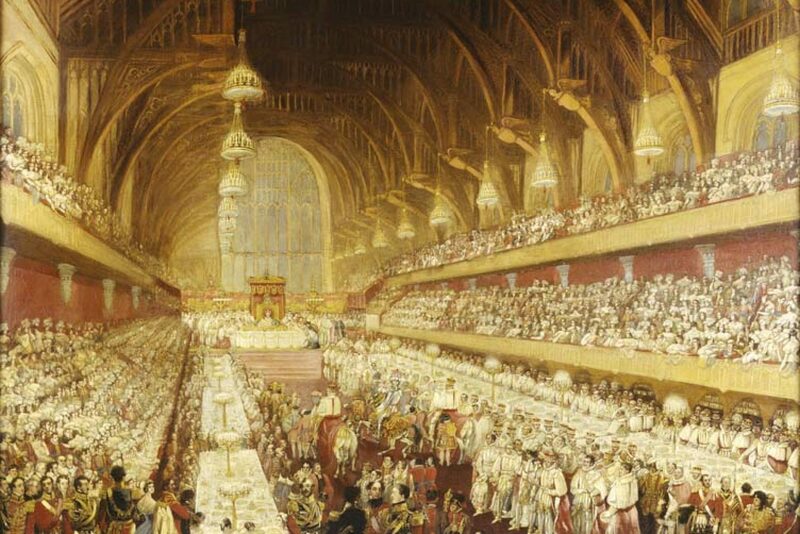 Today’s subservience of Members of Parliament to government is much more worrying an institutional trend than individual venality over expenses. Yet it is the scandals over these expenses that has triggered today’s crisis and which now offers a major and healthy opportunity for Parliamentary reform. So finally how might we fix the broken compass? At the heart of the individual and institutional failings of Parliament lies this uncomfortable truth. For far too many people in politics compliance has replaced conscience as the arbiter of what is right and what is wrong. Perhaps it is spiritually relevant to this debate to remember the question Pontias Pilate asked before disregarding his own conscience and complying with the pressures from the crowd: “What is truth?” – unfortunately he did not stay for an answer. I suggest we will only get the right answer to questions such as “what is truth?” or “what is right?” until we have gone through the painful but necessary cleansing process of electoral and Parliamentary upheaval which has only just begun. All the wrongs that I have just listed, plus a root and branch clean up of the Parliamentary expenses rules can be put right by the votes of the electorate and by a new reforming Parliament. It has happened before in our history, notably at the time of the Great Reform Bill of 1832. Indeed a new government and Parliament might usefully consider whether Britain needs a Great Parliamentary Reform Bill of 2010 or 2011 to give us a differently motivated political class and a new political compass. At least the great debate is now starting. Thank you for putting on this early instalment of it in St Mary le Bow today. Below is the text of a news release issued by HM Treasury on 30th November 1994 (reference 141/94). Treasury Chief Secretary Jonathan Aitken emphasised today the Government’s commitment to providing the taxpayer with better services that cost less and announced further reductions in the size of the Civil Service. He said “The new plans announced in yesterday’s Budget represent a 10 per cent reduction in real terms in the costs of running central Government between 1993-94 and 1997-98. The public sector is increasing its efficiency while delivering high-quality services to the taxpayer. “The size of the civil service is falling, too. There are 10,000 fewer civil servants now than in April, and numbers have fallen by 40,000 since the last election. The Civil Service is now at its smallest since 1939. The plans announced in the Budget will ensure that this trend carries on. “Service to the public is our priority: but we can serve people’s needs without squeezing their pockets. The Government’s programme of Fundamental Expenditure Reviews are covering the whole of Whitehall and improving the cost-effective delivery of front-line services on all fronts. The Defence Costs Study at MoD, which I oversaw, produced annual savings of Pounds 750 million and actually enhanced operational capability. Today the Customs and Excise is announcing the results of its Fundamental Review, which has identified cuts of 4,000 posts by the end of the decade; the NHS will reduce bureaucracy in its HQ and in intermediate layers of management by 21 per cent; the Department of Transport is increasing its efficiency by a fifth; and the Treasury itself is consulting on the recommendations of its Fundamental Review, which could lead to savings in senior posts of more than a quarter, while improving its performance as an economics ministry. “Running costs spending is being planned and controlled more sensibly, too. The new rules for end-year flexibility mean that Departments can now carry over unspent running costs provision from one year to the next: last-minute splurges on 31 March no longer need to happen.